The eighteen-month struggle of the just-shuttered San Onofre Nuclear Generating Station (SONGS) has been chronicled in detail by GTM. The two-reactor nuclear facility, 78 percent owned and entirely operated by Southern California Edison (SCE), went on-line in 1983-1984 and was taken offline in January 2012 after detection of radioactive steam leaks. The outage was an immediate concern for SCE, the California Independent System Operator (the ISO) and San Diego Gas & Electric (SDG&E), California’s third biggest utility and a 20 percent owner in SONGS. The utilities called on customers to conserve electricity, and the ISO got permission from the California Public Utilities Commission (CPUC) to temporarily bring back two gas-fired power plants previously closed as part of the state’s clean air efforts -- at a $2.5 million per month cost to SCE and SDG&E. 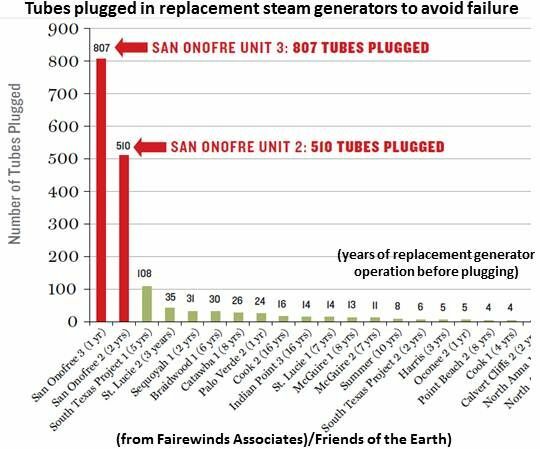 Of SCE’s proposal to restart Unit Two, Fairewinds said both units should remain shut down until the NRC’s investigation judged them safe. When SCE parent Edison International (EI) reported its Q2 2012 financials, the reason it wanted a quick restart became clear. Its stock price had dropped 43 percent, reported EI CEO Theodore F. Craver, and Edison Mission Energy (EME), its other major subsidiary, was in financial trouble. Carver’s promise of cost recovery from Nuclear Electric Insurance Limited (NEIL) was an empty one, because NEIL is less an insurance company than an industry pool with limited resources and responsibilities, former California Energy Commission attorney John Geesman said. Late in 2012, the CPUC voted unanimously to launch a formal investigation into the “reasonableness and necessity” of SCE and SDG&E decisions leading to the outage. A decision against them would force the utilities to return over a billion dollars in charges passed to ratepayers and to prohibit them from charging ratepayers for the estimated $671 million SONGS repair. 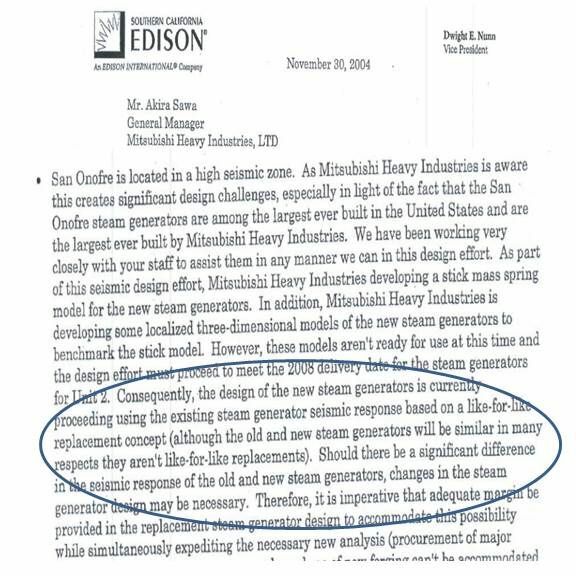 “The MHI report appears to squarely place the cause of and responsibility for the outages at San Onofre at Edison’s feet,” concluded S. David Freeman, former Los Angeles Department of Water and Power head. At nearly the same time, new Edison (NYSE:EI) financials showed SCE had continued passing its increased costs on to ratepayers . They also showed MHI had rejected most SCE claims for compensation and suggested further restitution would only come with legal proceedings. SCE continued to argue for a quick restart. The final straw was last month’s call by Senator Barbara Boxer (D-Calif) for a Justice Department investigation after letters were discovered showing that SCE purposely misrepresented the renovations to regulators as "like-for-like" (though it knew they weren't) in order to avoid the costly license review. At the same time, the ISO reported two important system improvements would ease the state’s power supply shortage in SONGS’ absence but warned that higher-than-expected demand during heat waves could cause problems for Southern California. “The continuing uncertainty about when or if SONGS might return to service was not good for our customers,” Craver said in announcing the SONGS shuttering. San Onofre staff is expected to be cut from 1,500 to 400 employees by the end of this year. SCE intends to pursue recovery of damages from MHI and NEIL. “This opens up the market to renewables to fill the gap,” former utility official Freeman said.